Colorado has long been a destination for hunters. Thousands of years ago, the Native Americans discovered the rich land Colorado boasted, with its bounty of big game. Later the settlers ventured into the daunting Rocky Mountain wilderness to glean from the hunting, fishing, and cattle market opportunities. By the mid-1800s, the news of Colorado’s majesty spread like wildfire, and today, hunting expeditions continue with sportsmen traveling across the country to experience the beauty that has enchanted the hearts of Americans. While the deer, elk and antelope are plentiful, the rugged Colorado terrain offers a heightened challenge for hunters, one that can be made easier with the use of horses. Sombrero Ranches, Inc. has horses for rent during all big game hunting seasons in Colorado, within permitted areas. We carefully pick horses for you and your hunting party based on your riding experience, terrain you are hunting in, and the size of your group. We offer a one-time complimentary delivery service* within fifty miles of our nearest horse camp. 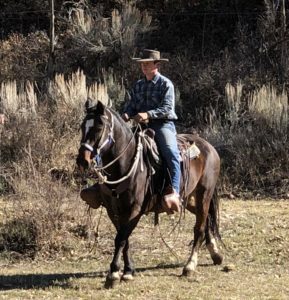 For your convenience, we have horse camps scattered throughout Colorado, including: Big Gulch in Craig, Colorado, Steamboat, Stable on the White River, near Meeker, Colorado, Morapos Creek Corral Campground, Dotsero near Sweetwater, Colorado and Williams Fork. We have been in the business of renting horses since 1958, so you can depend on us to provide you with horses for a better, and more enjoyable hunting experience! We also offer overnight camping and hunting options, please see our Williams Fork Hunting Information. *Please note we can only deliver to permitted regions. Please call our main office at (303) 442-0258(303) 442-0258 to confirm your hunting location is in an area we are permitted. All horses come with the tack necessary to ride western style: western saddle, bridle, halter and lead rope, pad, and blanket. 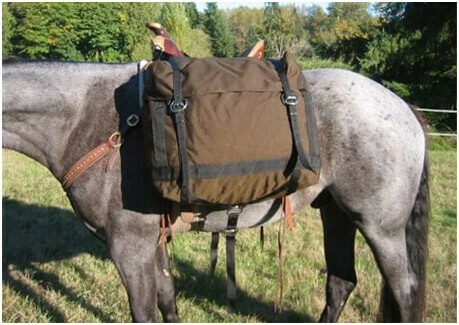 We do NOT supply pack saddles, curry combs, wide stirrups, rifle scabbards, saddle panniers, high-lines, breast collars or any additional specialty items. These items are the responsibility of the RENTOR, should they be needed. Hay and grain are available for purchase, and will be brought upon delivery of your horses. NO refunds will be issued for any unused hay or grain. FEED COSTS THROUGH SOMBRERO RANCHES, INC.
Sombrero Ranches, Inc. will deliver and pickup your horses one time, included in your rental fee. Additional delivery, pickup or exchanges will be charged at a rate of $4 per loaded mile, and automatically withheld from your deposit. 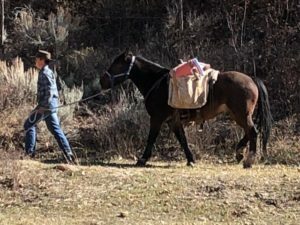 Horses that are delivered at a distance greater than FIFTY miles from our nearest horse camp will be charged a fee of $4 per loaded mile, one-way charge only. We do NOT guarantee a delivery before 11:00 a.m., and should you require the horses earlier than 11 a.m., please plan to arrive the day before to receive your horses. If you pick up your horses, we offer more flexibility with timing, and we will schedule your pickup time with the submission of your contract. Please note that Sombrero Ranches, Inc. acknowledges that weather, travel, and horse related occurrences happen, and renters could wait up to twelve hours for pickup and delivery of rental horses. All delivery locations are subject to change depending on weather conditions, and availability to get to location with a pickup and trailer. Any refundable deposits will be mailed after the close of all hunting seasons, approximately the end of December. If you leave your horses unattended, you AUTOMATICALLY forfeit all deposit monies. You must be present at both delivery and pickup of your rental horses. Deposits will also be automatically forfeited for cancellations less than fifteen days prior to delivery date. Planning a Better Trip for You and Your Horse! A horse requires at least twenty-five (25) pounds of quality hay per day. As a company policy we also recommend that you feed six (6) pounds of grain per day. This ensure the horses are full and they have enough energy to last the day. When feeding, each horse will need their own separate serving of hay, to prevent fighting, and possible injury. Bigger horses require more feed. If you have a large draft size animal, they need at minimum thirty (30) pounds of quality hay. BLM, Wilderness, and National Forest Service all require certified weed-free hay. Wilderness lands DO NOT allow bales of hay to be brought in, only cubed feed. USE CAUTION WITH PELLETS AND CUBED FEED. WE DO NOT RECOMMEND PELLETED FEED. CHOKING HAZARD. Cubed and pelleted feeds can be used, if they are soaked in water, for at least an hour, prior to feeding. This does require the use of a bucket, or water holding device, as well as easy access to water. To know how much to feed each horse, read manufacturer’s instructions on packaging. The average horse weighs 1000 pounds with draft size horses reaching 1400 pounds. Horses must be fed twice a day, and cubes or pellets must be rehydrated prior to every feeding. A horse MUST be watered at least three (3) times per day, and more often if you are using them. Horses refusing to drink should be monitored carefully and given more opportunities to drink. The key to keeping your horses healthy during your trip is to ensure they have access to clean water, often. It is important to saddle your horse properly not only for the safety of the horse, but your safety as well. First, the horse should be assessed for how dirty he/she is; leaving mud, leaves or foreign objects on their backs while they are saddled can lead to soring and even misbehavior! Once their backs have been cleaned, check the blanket and pad to ensure they have not fallen in the dirt. Place the blanket closest to the horse’s skin and the thicker pad on top. The front fold of the blanket should be in line with the horse’s shoulder. The pad and blanket have a natural tendency to move backwards throughout the day, so be sure to keep an eye on it, and adjust as necessary. Next, the saddle and cinch should be inspected for dirt, twigs, etc. that are stuck in cinches. The saddle should be placed just behind the front shoulder. The cinch should go under the horse’s belly, from right to left, and attach on the left side (or driver’s side). 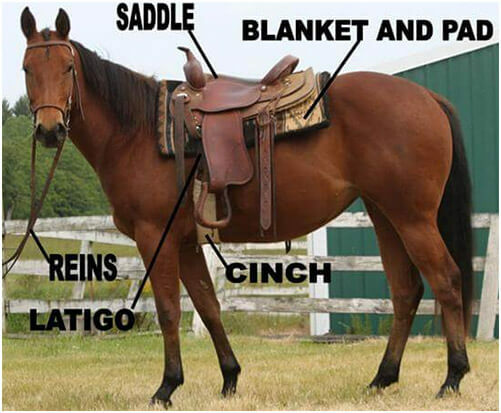 The cinch should sit just behind the front armpits of the horse, but not rub them. The latigo should be tightened where is it comfortable, but not painful for the horse. A good way to measure if it is tight enough is by sliding your fingers between the horse’s body and cinch. If you are still able to get your fingers between them, then it is suitable. Do not over-pack, ride double, or ride and pack horses at the same time. Overworking horses will cause soring, lameness, and in some cases colic. Use both the saddle pad and blanket provided for you during your rental. Be mindful that the equipment stays in the proper location throughout the day. More importantly ensure that your saddle is not rubbing on the horse’s withers, armpits or back. Proper adjustment of the cinch will reduce the risk of cinch soring. For guidance on the tightness of a cinch, see the section on saddling your horse. Balance your weight on the horse’s back evenly. Ensure that your stirrups are the same length and you are centered in the horse’s back. When using saddle panniers, carefully balance the load, to make sure it is even. Uneven loads will lean to one side, causing rubbing and soring. 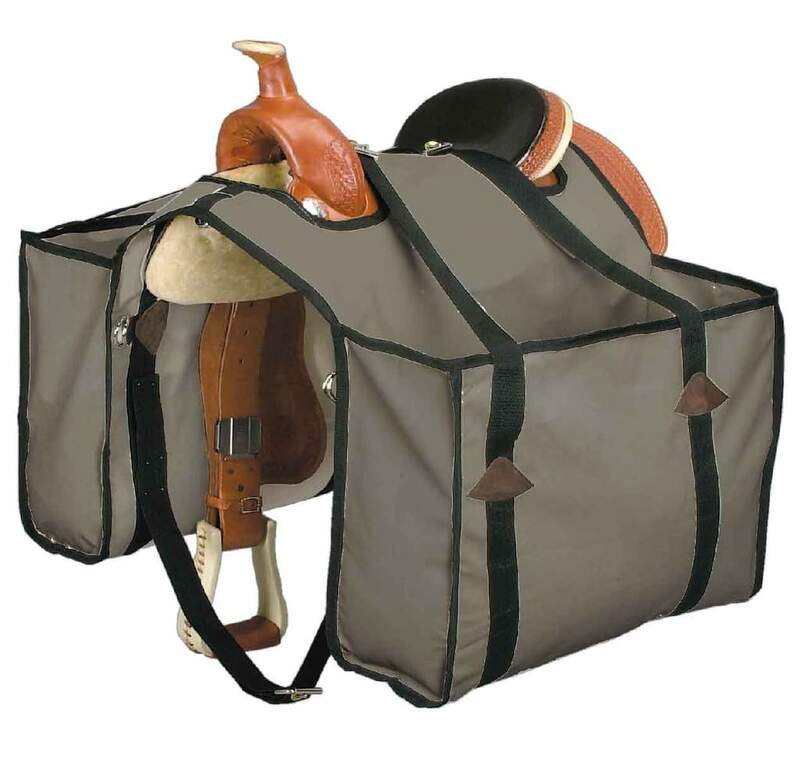 DO NOT PACK MORE THAN TWO HUNDRED (200) POUNDS PER HORSE. This means, one hundred (100) pounds per side. When using panniers, make sure the saddle has been adjusted properly and both the pad and blanket are in the correct spot. Pack the panniers with the heaviest objects on the bottom, and fill the tops with the lightest objects. DO NOT put sharp objects in the panniers, this includes, but not limited to: unsheathed knives and axes, antlers, and hanging forks. Should a horse accidentally slip on a trail, sharp objects can puncture saddle panniers and injure the horse. 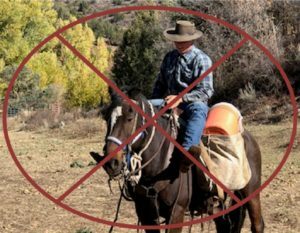 DO NOT pack an entire elk, deer, or antelope on a single horse at ANY time. A horse can carry two hind quarters OR two front quarters and back strap, at one time. Below is the proper packing and riding techniques permitted within the confines of the contract. 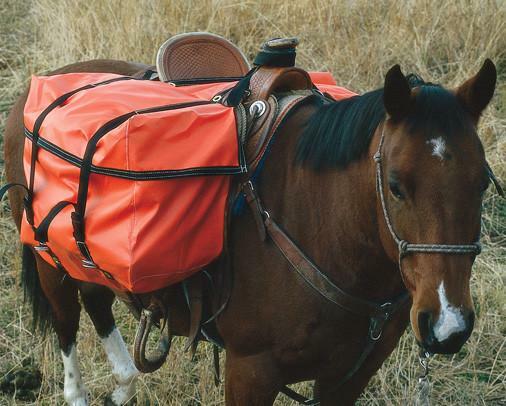 The photo below demonstrates an example of riding and packing at the same time, riding and packing at the same time is NOT PERMITTED. Renters found riding and packing at the same time will pay at minimum the cost of the rental deposit. EVERY night, horses must be unsaddled and unbridled. Your horse may ONLY have a halter on at night, to ensure they receive optimal rest. Upon returning to camp, your horse must be watered promptly. Allow adequate time for the horse to drink to contentment. Some horses feel vulnerable drinking water in a new location, be patient, and allow them to have multiple attempts at water as they adapt to their surroundings. The next priority is ensuring horses get enough to eat. If you are feeding pelletized or cubed hay, it must have soaked in water at least an hour prior to feeding. Cubes, pellets, and hay should all be separated into multiple plies to prevent fighting. CAUTION SHOULD BE USED WHEN FEEDING PELLETS, AS THEY CAN CAUSE CHOKING. 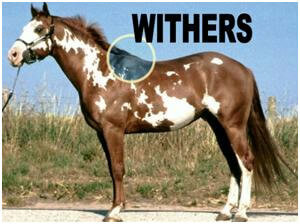 Check your horse’s back for hot spots, sores, or rub marks on their back, withers, and over their kidneys. If a horse has started to develop any AREAS OF CONCERN, immediately discontinue use, as these can take weeks to heal. 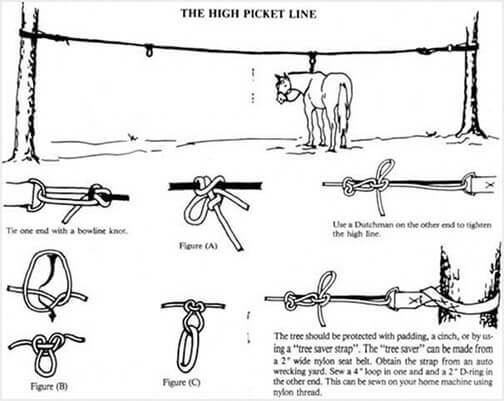 The National Forest Service, BLM and Wilderness areas require the use of high-lines for tying horses. Information on this can be found in the “Back Country Horsemen of America Guidebook.” When tying your horses, use a quick release, slip knot. This ensures if an incident happens you can easily release the horse from the tie. Tie your horse short enough that it is unable to step over the lead rope, or get tangled up with others, but long enough to be able to rest head and small movements. We recommend that when feeding horses on the ground, lengthen their lead ropes until they are finished eating, then shorten the lead ropes again. DO NOT tie horses to fallen dead trees, that if spooked, they could drag or move. DO NOT tie horses under or to trees that could fall if pulled, or in strong winds. DO NOT tie horses to vehicles, camping equipment such as a tent, the ground or any other unsecured, breakable, or dangerous objects. Our horses are not trained to load in straight load, or small trailers, such as two horse trailers. If you plan on picking up your horses, and hauling, please provide a larger stock trailer. When unloading you horse, always untie them before opening the trailer door. Allow the horses to back off the trailer and take their time stepping down from the elevated deck. When loading the horses, do not use constant pressure when leading. It is a give and take relationship. Face them towards the trailer, give a small tug, then release. Do not fight them, few can win a tug-of-war against a 1,200-pound animal. DO NOT leave a horse in the trailer over-night. DO NOT travel for longer than eight hours, without unloading the horse, and giving them the chance to rest and eat. Please take the time to get to know the rental horses that will be under your care by asking our staff any questions that you may have. The best time to do this is when your horses are dropped off, or if you come to pick them up. IN CASE OF NATURAL DISASTER, PHYSICAL HARM, OR OTHER LIFE-THREATENING EMERGENCIES, call 911. To arrange for return of your horses: Call the Sombrero phone number on your contract to notify a horse pick up is needed. Return horse to location that it was dropped off at. STAY with horse until Sombrero Ranches, Inc. arrives.